Traffic is one of the biggest problems the Philippines has not yet solved. Traffic-regulating bodies in the country are currently working out some new regulations for both public and private vehicles to lessen the traffic on major roads. The Metro Manila Development Authority (MMDA) is the government agency that handles traffic in the capital. So it just makes sense that it provides an app for people to know the traffic situation when people need it. It partnered with online news portal InterAksyon to create the app. 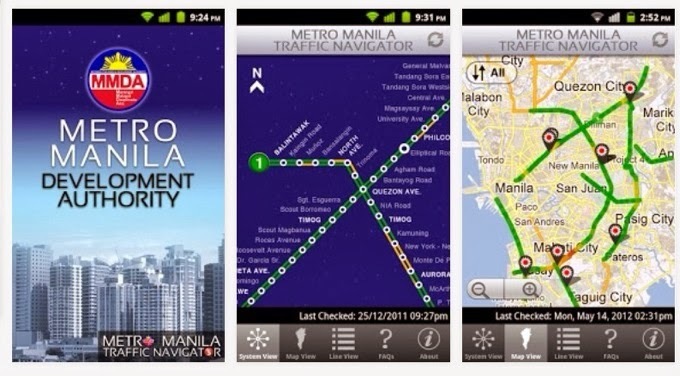 Launched in 2011, the app, available for Android and iOS, gives users access to the traffic situations across major routes in the Metro. Different views like the system view and the line view can be accessed, with indicators as to whether the traffic is light, moderate, or heavy. Apart from the app, the same makers also recently launched the MMDA Traffic Mirror site which provides users a live feed of the traffic situation. Waze uses a different approach in traffic reporting. It is known as a social traffic app as it uses crowdsourcing to collate traffic information. We earlier noted how it was used in Indonesia in holiday traffic jams. It is also gaining traction in the Philippines. App analytics site Distimo shows that, in the past quarter, it ranks as the second most downloaded navigation app in the Philippines. Waze was created by an Israel-based startup. It recently won at the Mobile World Congress 2013 as the best overall mobile app. And following this, it was acquired by Google for around $1 billion. TrafficDito is similar to Waze as it’s also a crowdsourcing mobile app available for iOS. But it’s created by a team of Filipino developers. The app is focused on providing traffic information in the Philippines. We earlier reported how it answers traffic problems in the country when it launched its iOS app in 2011. Like the other apps, it has a map where users can track the traffic situation through colored markers which signify light, moderate, or heavy traffic. In addition to this feature, the makers of the app note that Filipinos have the habit of venting traffic situations through social media sites. So it was made in a way that users of the app can report traffic – and find info – through a social feed it calls ‘stream.’ Apart from the information collated through reports, it also uses Twitter to source information. It includes in its stream all the traffic-related tweets in the Philippines in the last three hours. Apart from guides on road traffic, there’s also MRTtrackr. 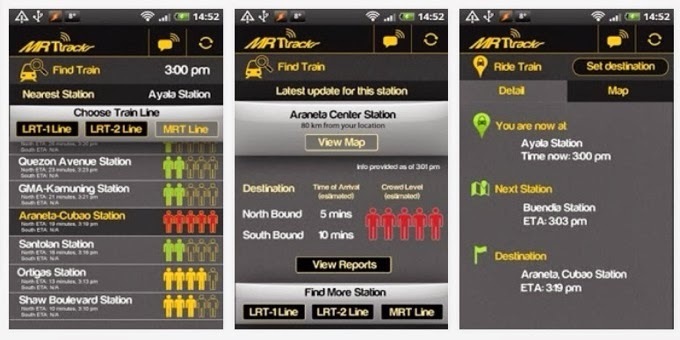 Launched in 2012, it’s an Android app to guide train riders. In the Philippine capital, there are three train lines: the MRT, LRT-1 and LRT-2. So, the app provides guides on the user’s proximity to the nearest station, and alerts the user when they’ve reached the station and even the time it takes for the next train to arrive. The trains in Manila are usually really crowded. Comparatively, it is even more crowded than the trains in Singapore and Hong Kong. So the app also provides an estimate of the crowdedness of the stations. In 2012, the app won the Globe Choice Award in the Google Global Android DevCamp Manila. Of course, no app is guaranteed accurate all the time, so these apps can even complement each other and give a big picture of the scene on the roads. So let’s be more prepared before hitting the road!